Hooray for Earth and humanity! VHEMT Volunteers and Supporters breed no more. A few billion more of us and we’ll save the planet once and for all. You may have already been a Volunteer or Supporter before hearing of the Voluntary Human Extinction Movement. Millions of people around the planet have independently arrived at the conclusion that Earth’s biosphere would be better off without humans. A little further down the thinking process and it becomes apparent that decreasing births rather than increasing deaths is the way to go, and voluntary methods are much more fun to advocate. We Volunteers and Supporters make up our own minds about life and what to do with it. Our diversity makes The Movement strong. A wide range of religious, political, and social thought is represented among us. Even our unofficial motto, “May we live long and die out,” has room for differing opinions: some prefer “May we live well and die out.” As explained below, Supporters don’t agree with the “die out” part of the motto. However, the first word in VHEMT is Voluntary. Although some who support VHEMT may also advocate involuntary solutions to our population density problems, they are not advocating for VHEMT when they do so. Loosely, we relate to VHEMT in one of three ways: Volunteer, Supporter, and Undecided. Because we’ve all arrived at our present awareness by different routes and at our own speeds, this simplified, seven-step diagram might not fit anyone exactly. However, this progression of awareness pattern seems to have emerged. Maybe a two-dimensional chart will provide a little direction and help us track the progress of ourselves and others. We all begin at birth, but our path of progressive awareness doesn’t begin until we grow beyond pre-awareness. Shock is the first step in our journey of progressive awareness. There’s no returning to the blissful ignorance of pre-awareness once we receive our first shock of reality. Shock doesn’t last for long—it can’t. People won’t live long in a state of shock. For almost all of us, denial is our first reaction to shock. Denial is a sanctuary from shock. This is a good time to stop and figure things out—to get emotionally and intellectually ready to continue the journey. Unfortunately, most people never leave denial. If you seem to be doing well with the way things are, what’s the problem? Living in denial robs us of peace of mind. Our conscience knows the nagging truth, and the anger keeps leaking in. When we stop denying reality, we are forced into the next phase—anger. It looks ugly and unprofitable. Hopeful anger is a powerful, driving force which can keep us working hard for years. Unfortunately, it is also hard on our personalities. People have sacrificed their Selves in the battle to preserve Earth’s ecosystems, often becoming cynical and giving up hope. Then they move to the hopeless anger phase. Phase four is home to the cynical and the misanthropic. The good aspect of this phase is that it allows many to consider human extinction for the first time. The bad aspect is that this option is usually considered without love. Famines and epidemics don’t seem so bad from this perspective. Anger is actually left over from denial. It means we haven’t fully accepted the situation yet. When we do, anger dies. More depressing than hopeless anger is acceptance without hope. Without anger to keep us going, unrealistic hopelessness can be a short-cut back to denial or even to suicide. People in this phase might not be so hard to take if they would just shut up about it. If they were angry, at least there would be some excitement to their dirges. Though often necessary, this phase should be as short as possible. It’s hard to break loose from a lengthy depression. Perhaps just realizing that there is hope... allowing ourselves to see the signs of hope, which are all around us, will break the spell and allow us to move on to the hopeful acceptance phase. Yes, there is still hope, and it will raise us out of the depths of depression. We can easily go too far, however. If our acceptance elevates into the clouds of mindless hopefulness, we will have lost some of our hard-learned awareness. Unrealistic hopefulness is socially graceful and more pleasant than some of the previous phases, but it too can be a short-cut back to denial. We must take the final progressive step. With a VHEMT perspective we move forward in a dynamic balance of optimism and pessimism, aware that our reality is both hopeful and hopeless. Once we accept that humans are hopeless as a species, there is renewed hope for the survival of the planet as a life form. Although there will be times when we fall back to an earlier phase, a VHEMT Volunteer is less likely to swing to and fro from yin to yang like a yo-yo. With a balanced awareness, our efforts to preserve life on Earth will meet with more success, no matter what those efforts may be. Reading Elizabeth Kubler-Ross’ stages of death in On Death and Dying, I was amazed that it was so close to the typical path of awareness in dealing with our “death” as a species. At the time, I didn’t realize that Dr. Ross’ stages correspond more closely than my sketch shows. “Bargaining” is a stage just before acceptance. Deals with God are attempted at this point. I didn’t think it applied to VHEMT. Over the years, I’ve shared with other Volunteers some of the many letters I’ve received asking if there’s some way out of our extinction: go into space, learn to live in harmony, invent a technological fix—something. They had achieved an understanding of what’s been done to the biosphere, and were done being angry about it, but weren’t quite ready to accept that we must disappear. Then someone pointed out that this is the bargaining stage, and it rang true. Just as people who know they are dying sometimes do, we could live the rest of our lives in the bargaining stage—hoping for a miracle to restore ecosystems and stop extinctions. It’s up to each of us to grow beyond these earlier stages. No one can do it for us. A hopeful hopelessness awaits our increased awareness. For general advice on helping others advance their awareness, and specific advice for hosting an information table or booth, see the Outreach page. Please note: Anyone can create an online group purporting to be for VHEMT, regardless of their intent. Some seem intended to discredit The Movement. Discretion is advised when joining a group claiming to be VHEMT. Account required. The primary group has around 2,000 subscribers. A FB Community has about 600 “likes”. For other groups, search for VHEMT. VHEMT Volunteers around the globe are signed up to receive notice when someone pays the $12 a month to create a group, and sets a date and location for meeting up. There’s a free discussion board for VHEMT at Meetup, but it’s difficult to navigate. Get a MySpace account and search groups for “human extinction”. There are several to choose from. Tribe members form discussion lists, and a member has created one for VHEMTers. “No more humans!” tribe is closely related. Group limited to Volunteers and Supporters has around 1,400 subscribers. Discussion was moved to Yahoo Groups in December 2000, and has been in existence since 1996. Discussion forums are also active to varying degrees in Arabic Facebook, Català Yahoo, French Yahoo, French Facebook, Italian Facebook, and Spanish Yahoo. You may also follow VHEMT on Twitter, as around 67,000 others are doing. Tweets are rare so far. Bike stickers. Reflective for safety. Stickers above are white with green letters on eco-unfriendly plastic-coated sticky paper which last a long time in harsh weather. 11.5 x 3 inches (29.3 x 7.6cm). “Vasectomy prevents Abortion.” From Respect for Life, royal blue with while letters. 7.5 x 3.75 inches (19 x 9.5cm). Additional stickers in same order are only half price. 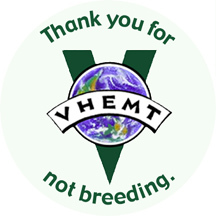 Full color version of the VHEMT logo on a 1.25 inch (3.2cm) plastic-coated metal pin. Additional buttons in same order are only half price. Black and white version of the VHEMT logo on a 1.25 inch (3.2cm) plastic-coated metal pin. Additional buttons in same order are only half price. Recognize the meritorious service of your friends, co-workers, and family, when they decide to not add any more of us to the billions. 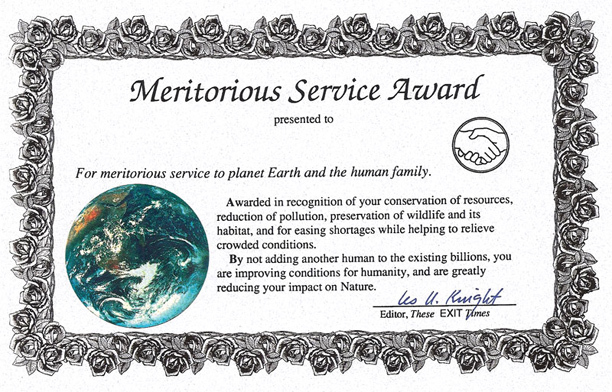 Frameable certificate, on fancy paper, 5.5 x 8.5 inches (14 x 21.6cm), with an EarthSeal sticker, signed by Les U. Knight. Or download a pdf of one for free. Premium quality, 100% organically-grown unbleached cotton, soft fabric, and most are union made. VHEMT logo over the heart, and the Visualize Voluntary Human Extinction cartoon on the back with “May we live long and die out” under that. Printed with fresh green ink. The back makes a great silent educator when standing in lines or queues. To find your size, measure a T-shirt that fits you from shoulder seam to shoulder seam. A slim cut is only available in size 15". On the order form below, please circle 15"slim (38cm), 15" (38cm), 16" (40.6cm), 17" (43cm), 18" (46cm) 19" (48cm), 20" (51cm), 21" (53cm), or 22" (56cm). If you wish to be sure it’s union made, circle that preference. You may choose from a couple dozen items with the VHEMT logo on them: T-shirts, caps, cups, mousepad, clock, and more. There is no text on the Ts from CafePress. International orders may be paid for with PayPal. (CafePress offerings are not affiliated with this website). Issue number Two (pdf). July 1992, 20 pages. Issue number Three was not printed in order to save trees. 1993, zero pages, out of print. Issue number Four (pdf). Printed on paper saved by eliminating number Three. August 1994, 16 pages. And then the World Wide Web took over, saving paper, printing, postage, and time. The VHEMT website reaches more people each day than the paper version reached in a year. Some Volunteers express their vehemence with body art. A Volunteer from New Zealand and her friend have matching tattoos, both placed over the place where no baby will ever grow. Possibly the friend of the New Zealand Volunteer above. Paul’s lower leg holds the vision of greener Americas and bluer oceans. Nick the Lemming in the UK sports a traditional biceps tattoo. Meredith’s is minimalist . . . for now, anyway. Hugh placed his downunder his biceps, earning his stripes in the VHEMT "arm-y". David's “permanent reminder,” with best wishes.